Our 2011 Kickapoo Reserve Dam Challenge Triathlon’s guests presented Amil’s Inn with 1st place trophy for providing the muffins which propelled them to 1st place!!!!!!! The 10th Annual Kickapoo Reserve Dam Challenge Triathlon will be held on Saturday, October 6, 2012. The Kickapoo Reserve Dam Challenge Triathlon event takes place within the 8,569 acre Kickapoo Valley Reserve, which boasts some of the hilliest terrain in the Driftless Region of southwestern Wisconsin. *7 mile paddle down the winding Kickapoo River along rock outcroppings and through diverse vegetation. *14 mile road bike ride through the hilly driftless area. The route takes you through the valleys and over the ridge, in one of Wisconsin’s most scenic rural landscapes. Steep climbs and rapid decents provide the ride of a lifetime! *3 mile trail run in the Kickapoo Valley Reserve. The route starts with a short stretch on Hwy P, then to a winding and wooded trail and finally leads you down the Old Highway 131 Multi-Use Trail, which is a deteriorating road bed. Proceeds from the Kickapoo Reserve Dam Challenge benefit the Kickapoo Valley Reserve Education Program. The Education Program offers unique hands-on environmental learning opportunities to students of all ages. Provided are opportunities for students to explore an outdoor classroom and learn-by-doing in a wide range of subjects from natural history and science to team building and outdoor adventure. In 2011, the Education Program at the Reserve served 3,750 local and regional students and community members. For more information about the Kickapoo Reserve Dam Challenge Triathlon visit www.kvr.state.wi.us/damchallenge/. To learn more about the Kickapoo Valley Reserve Education Program and other Kickapoo Valley Reserve opportunities visit www.kvr.state.wi.us/. 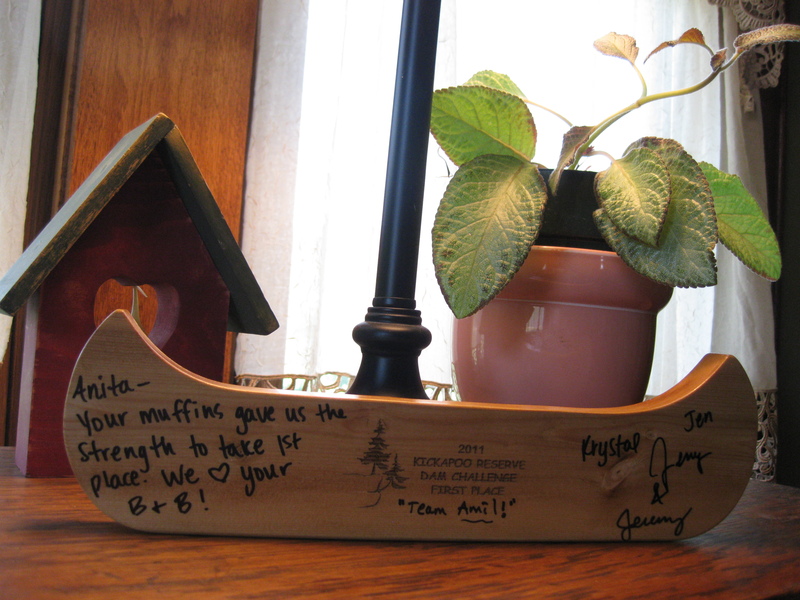 Amil’s Inn Bed and Breakfast was happy and honored to have several Dam Challenge participants as guests in 2011 and will have several participants as guests in 2012 as well.